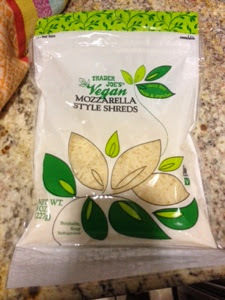 I was so excited to see that Trader Joes had finally made a vegan cheese (not just a veggie one that still had casein in it). It is SO gross. I do not recommend it. I cant even tell you how excited i was about it because it really looked like yummy shredded cows cheese. I was excited to melt it and make cheese bread and garlic bread. I had big plans for this bag. It was so gross. no matter how i cooked it it was gross. Also uncooked it didn't taste good. what a bummer.